Your trading strategy to accumulate wealth requires a different approach than the tactics you use to generate income. To build a significant amount of wealth that will allow you to live the lifestyle you have worked so hard for, you need the formula that will progressively generate profit and increase your capital. Understanding which indicators to use, what patterns are best suited to finding wealth-building trades, and how to take positions that control your risk -- all require proven methods that consistently build your wealth. *Which technical indicators help identify which Wealth Plays can generate the biggest returns. Most importantly, Velez walks you through the Trade for Wealth process, handing you everything you need to recognize which trading tactics can actually be preventing you from achieving more profit, more success and more long-term financial independence. Get started now putting this arsenal of Wealth Plays to work for you. Power Trading brings together three remarkable trading approaches, which are the cornerstones of the educational sessions presented by Velez and his trading team. This DVD and guidebook combination was designed to help you identify the plays that will work best with your trading style, personality, and current portfolio. Only in this book/DVD course combination will you be able to fully absorb the wealth of material that Oliver Velez is set up to offer. The easy-to-understand definitions and eye-opening self-tests bring the information to you and the power to your trades. So don't end up on the wrong side of the market. Swing Trading is the perfect tool for the investor who wants to understand the forces that shape the trading arena. This presentation has been viewed live and on DVD by hundreds of thousands of traders. Now you can use this course to rise above the impulse of novice traders. It's the best way to master the cycles and win consistent profits. Strategies for Profiting on Every Trade is an accessible, reliable course for the trader looking for profits in the competitive, dynamic world of trading. Each section of the book offers clear examples, concise and useful definitions of important terms, over 90 charts used to illustrate the challenges and opportunities of the market; and how you can take advantage of patterns. Written in the parlance of the day trader's world, you'll enjoy the experience of being taught trading skills by the best of the best. This focused and effective trading resource features seven key lessons to further a trader's education including market basics, managing trades, psychology in trading and planning, technicals, utilizing charts, income versus wealth building producing trades, and classic patterns. As co-founder of Pristine.com, and founder of Velez Capital Management, Oliver Velez is one of today's most influential traders. A respected lecturer, best-selling author, and an all-around market guru, Velez has dedicated his life to spreading the message that you, too, can make a living as a trader. It's no wonder Dow Jones dubbed him "The Messiah of Day Trading." * Option Trading Tactics: See how Velez uses various strategies to maximize returns while minimizing risk. * Predict Price Movement Accurately: Know what stocks may do in the upcoming days and weeks. This is they only way you will make money in options. * Market Analysis Strategies: Velez will show you why technical analysis is the key to options success and how to use this knowledge to take advantage of marketplace imperfections. * A New Approach to Trading Psychology and Discipline: Discover the Pristine Method of "core trading" and Velez's groundbreaking explanation of how the stock market works today. * Develop Your Own Strategy: Create then follow a strict trading plan-one that will allow you to play the market with burning through cash! * Use Options Trading Tactics, and within no time, you'll be a more confident and profitable options trader than you ever thought possible. Note: This Course book with DVD was written and recorded by Oliver Velez during his tenure as CEO of Pristine Capital Holdings, Inc, which he founded in September of 1994. His new trading techniques today, which focus more exclusively on the professional trader, take his older concepts to a new level of power and effectiveness. Tools & Tactics for the Master Day Trader is designed to help active self-directed traders gain the knowledge and acquire the tools necessary to approach the markets with intelligence and a well thought out trading plan. This no-nonsense, easy read is meant to be referenced by traders every trading day and covers everything from battle-tested trading strategies to intuitive insights on psychology and discipline. Proving once again that the best teacher is experience, Tools and Tactics for the Master Day Trader will help any trader with the technical skills, market knowledge, and confidence needed to increase the odds of achieving more winning trades and capturing profits. Finding profits in today's markets can be overwhelming. Now, one of the most sought after educators in the industry, Oliver Velez, cuts through the noise and hands you the five tactics that will get you to winning trades. From clearly seeing the trends in the chaos of market, to zeroing in on plays that are about to breakout and the key to significantly minimizing losses - this course hands you 5 of the most effective weapons to beat the markets. * How to use moving averages to increase your winning trade percentage. *After this exceptionally clear direction, you will see how these tactics line up and come together to put you on the path to profitability. Supported with a full color online manual, this course is enjoyable to watch and unparalleled in its potential to provide a huge return on your investment many times over. In this four-hour presentation, one of the most sought-after educators in the industry, Oliver Velez, will change the way you view the markets. With in-depth trend analysis and discussion, you get inside access to the aggressive tactics, which Oliver employs. Inside, Velez elaborates on candlesticks, entry points, retracements, stops, and more. He will also define the four major obstacles that traders face, and show you how to overcome them. * Specific market trading formulas to laser in on where the markets will go... often within a window of two ticks and/or five minutes. The concepts he shares can be applied across a broad spectrum of trading opportunities, and his strategies have proven profitable in various markets and time frames. Armed with the knowledge of these concepts and tactics, you will have the confidence to make market opportunities work like never before. In the early 1990's Oliver Velez dubbed the term Swing Trading in an article written about a style of short term market play he designed for traders desiring quicker profits than the traditional buy-and-hold approach. The term caught on and a new industry was born. 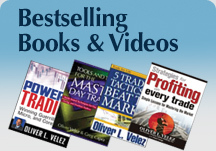 The DVD workshop reveals Oliver Velez' all powerful style of trading called Swing Trading! The DVD comes with an online manual featuring everything you need to master Swing Trading and take it to new levels of success. See why one trader says he bought the tape... made $700 on a short sale right off the bat using the technique. Note: This DVD was recorded by Oliver Velez during his tenure as CEO of Pristine Capital Holdings, Inc, which he founded in September of 1994. His new trading techniques today, which focus more exclusively on the professional trader, take his older concepts to a new level of power and effectiveness.